Cut avocados in half (long way), take out pits. 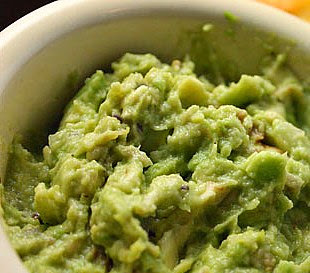 Spoon out avocados into a large bowl and mash with a fork to desired consistency. Add lime juice, finely minced garlic and all other diced vegetables. Add seasonings to taste. Mix together and put the seeds in the bowl to prevent the avocados from turning brown. Refrigerate and serve with a favorite vegetable (bell peppers, cucumbers, celery).